Somehow, enough time has crept up on me that I’ve been able to establish two fall traditions as a resident of Virginia. They include, for one, a pre-Halloween trip to a haunted forest in the Richmond exurbs, squarely in the middle of nowhere. After sunset, our little group takes back roads to a huge cornfield framed by dark forest and, probably, serial killers. We board a hayride bound for the middle of that cornfield, where we’re dropped off and left to fend for ourselves. Stumbling our way through a corn maze, we pass a roaring bonfire that marks the entrance to the haunted forest. It’s a setup that poises you to react like a high-strung Thoroughbred before a big race, ready to shy away at the drop of a feather. So we trot and high-step our way through barely-lit abadoned houses, accompanied by soft but pulse-quickening horror-movie music, accosted and pursued by entirely too many deranged-looking men with chainsaws. Both years, I’ve been laughed at for screaming so loudly. And that’s all I have to say about that. But I’m like most people, I think, in that I can only handle approximately one traumatic event per season without unraveling. I need a respite from the chainsaws. So I have a relaxing fall tradition, too—the annual apple-picking visit to Carter Mountain Orchard in Charlottesville. Here’s how that works: as a reward for coating your car with an inch of dust on the trip uphill, you’re greeted with sweeping views of the countryside, rows upon rows of trees heavy with fruit, and warm apple-cider doughnuts coated in sandy cinnamon sugar. Yes, it’s a tradition that I like very much. The thing about apple-picking at Carter Mountain, though, is that it always leaves me wanting more—more apple cider doughnuts, that is. And people, Charlottesville is two hours away. There had to be some way of extending this experience into my home kitchen, right? The talented staff of The Washington Post helped me out on this front, with a recipe adapted from pastry chef Lauren Dawson. Recently, I had the opportunity to attend a panel discussion that included Deputy Editor of the Food section Bonnie Benwick, who inspired me to sample more of the paper’s recipes. I’m so glad I started with this one: it resulted in puffed, hearty cake doughnuts, thick-crusted and airy-crumbed and cider-infused all at once. They were good enough to rival the Carter Mountain experience; the only thing missing, of course, was that aerial view of hilly Charlottesville and a crisp wind at my back. At Hearth, Lauren Dawson serves these with applesauce and cider-infused whipped cream. 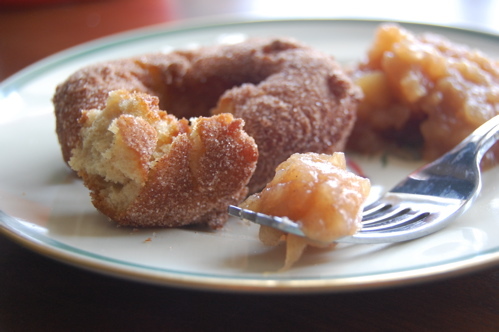 Try the applesauce below, and supplement her apple-cider glazed doughnuts with a few coated in powdered and cinnamon sugar, too. 1) In a small saucepan, heat the 1 cup of cider over medium heat until reduced to 1/4 cup, about 20 to 30 minutes. Let cool completely. 2) In a medium bowl, combine flour, baking powder and soda, 1 Tbsp. cinnamon, salt and nutmeg. 3) In a large bowl, beat together butter and 1 cup granulated sugar until fluffy and pale yellow. Add eggs one at a time, and stir until each is fully incorporated. Mix in the cider reduction and buttermilk. Add flour mixture and stir until just combined, making sure not to overwork the dough. 4) Prepare two baking sheets by lining them with parchment paper and dusting them generously with flour. Turn the dough onto the first sheet and, with generously floured hands, press dough down until its height is 1/2″. Transfer sheet to freezer for 20 minutes. 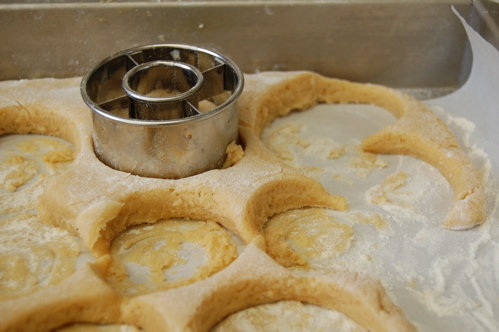 5) Once 20 minutes have passed, remove dough from freezer and proceed to cut out doughnuts and doughnut holes. (Use a doughnut-shaped cookie cutter with a 2.5-3″ diameter.) Dough scraps can be pressed out again and cut as well. Place cut doughnuts and holes on second baking sheet, then refrigerate for 20-30 minutes. 6) Prepare separate plates for each topping to be used, and place respective topping ingredients onto each one. For cinnamon sugar and cider glaze toppings, stir mixture with a spoon to distribute ingredients evenly. Additionally, set aside a plate lined with paper towels, as well as a cooling rack. 7) In a wide, shallow saucepan, heat 3 inches of vegetable oil to 350 degrees Fahrenheit. 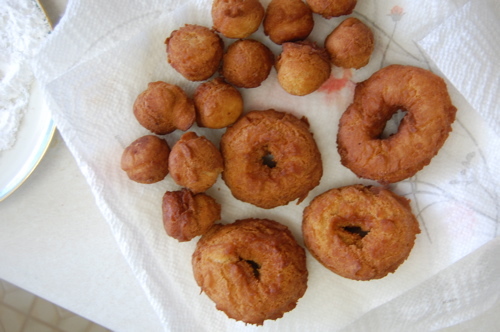 Fry doughnuts in batches (without crowding the pan), cooking for 1 minute on the first side and 30 seconds to 1 minute on the other. Transfer cooked doughnuts to paper towel-lined plate to drain. 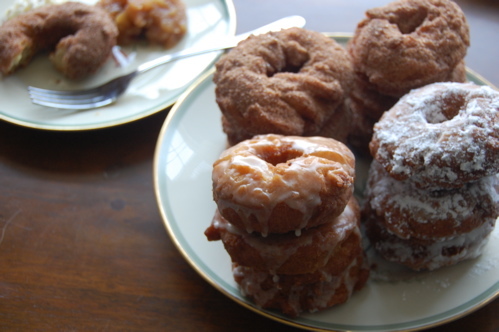 8) Top the doughnuts: while warm, coat in cinnamon sugar or dip into cider glaze. For the powdered sugar topping, wait until doughnuts have cooled before dredging. Transfer finished doughnuts to cooling rack. 9) Enjoy immediately with warm applesauce. Doughnuts will keep well for one day. I halved the sugar and cinnamon in Shannalee’s über-simple recipe, because I like my applesauce to taste mostly of tart fruit with just the faintest hint of spicy sweetness. If you prefer a sweeter or more cinnamony sauce, go ahead and double those amounts. 1) Peel, core and dice apples. 2) In a soup pot, combine the apples with all other ingredients, then bring mixture to a boil over medium-high heat. Cover pot and reduce heat to low. 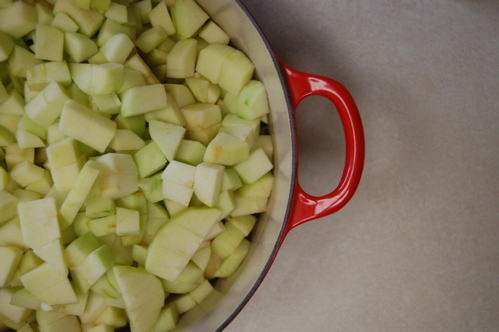 (It may seem as if there is too little liquid in the pot, but the mixture will bubble up and cook the apples evenly.) Cook for 30-40 minutes, or until apples are very soft. 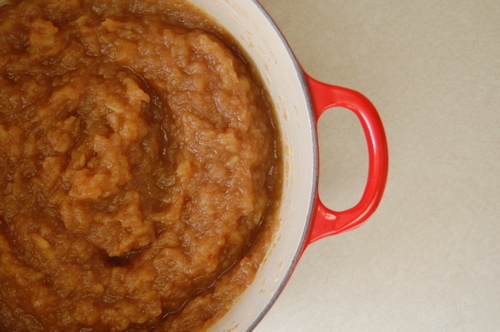 3) For a rustic, chunky applesauce, crush any apples pieces that are still intact with a fork or the back of a spoon. For a smoother purée, use an immersion blender or food processor. 4) Enjoy warm (with doughnuts!) or chilled. Applesauce freezes very well, too. And if you’re looking for something to do with a few cups of leftover sauce? Look no further than this spiced applesauce cake.